Recently, my boyfriend David turned twenty-seven years old. I decided to give him exactly what I would have wanted if I were trying to celebrate a milestone on the road to becoming old and decrepit: a scavenger hunt! Nobody loves scavenger hunts more than I do… including David. I should remind you that birthdays are kind of a big deal in my family. So you can imagine my horror when David told me that all he wanted for his birthday was to relax and play violent, war-themed video games in his boxer shorts. Obviously, this man had no idea what having a birthday even meant. Lucky for him, he’s dating someone who does. So I went about crafting intricate clues to go along with little gifts for him to discover throughout the day, painstakingly handwriting each clue in impeccable calligraphy. As I worked long into the night, I thought about how lucky David was that I knew what a real birthday entailed. He was going to have such fun. The answer was, of course, Seagrass. This “sustainable, organic, and local” restaurant is owned by the Perez family, all of whom participate in its operation. Chef Robert Perez’s older son, Ruben Richard, is the wine director; Robert’s wife, Marianna, manages the aesthetics of the space; and their younger son Ruben’s life partner, Erin Gailsdaughter, also works at the restaurant. 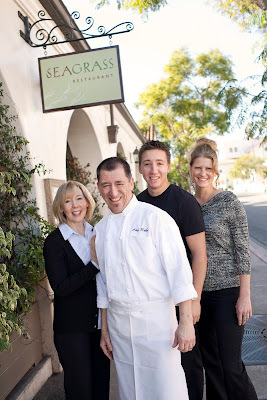 A member of the Ty Warner Sea Center’s Sustainable Seafood Program, Seagrass acquires all its local fish and shellfish from Kanaloa Seafood and Santa Barbara Fish Market. Most of their produce comes from bi-weekly shopping trips to the farmers market. They had recently offered a Groupon deal for their dinner tasting menu, and of course I’d jumped on that deal quicker than you can say, “The ocean + Something you’d smoke to get high.” And that brings me back to the clue… which was going nowhere, slowly. “Sea… weed? !” David guessed for the hundredth time, furrowing his brow. “Atlantic… crack? No. Pacific meth!” Our bartender chuckled and rolled her eyes. I didn’t know whether to chuckle or to be concerned that David had such an extensive mental list of things you could smoke to get high. I guess nobody uses the word “grass” anymore. But after much coaxing, I finally got David to say the words, “Sea… grass?! Seagrass. Oh, Seagrass!” and we were on our way. The first thing I noticed upon entering the restaurant was how dark it was inside; heavy maroon drapes kept out any of the night’s remaining natural light and the interior lighting was decidedly dim. The understated décor was punctuated by large seashell fixtures and little green specks of light projected onto the ceiling, perhaps meant to represent moonlight filtered through ocean water or the light at the end of a dock. But if I stared at the green lights for too long, I found myself longing for dreams just beyond my grasp, all Gatsby-like, so I focused on the delicious food instead. The lighting does not flatter this smoked salmon dish. So you’ll just have to take my word for it that these dishes looked as good as they sound. To start, I got the little gem salad with blue cheese, bacon, and cherry tomatoes. “Little gem,” also called “sucrine,” tastes like a combination of Butter and Romaine lettuce. It is flavorful as far as lettuces go, which is admittedly not very far. David got the smoked Scottish salmon with greens, emulsified olive oil, and capers, pictured unflatteringly above. For the main course, I got the pan-seared, oven-baked sea bass on roasted eggplant with a possibly magical veal reduction. David’s maple duck was also pan-seared and oven-baked, served with summer vegetables. The tasting menu included dessert (phew! ), and I gobbled up my chocolate mousse with salted caramel and Chantilly cream almost as fast as David devoured his toasted vanilla bean ice cream. Yes, toasted ice cream, the classy older cousin of the deep-fried ice cream you always see on menus at Japanese restaurants but are too afraid to order. The whole meal was beyond satisfying. With every course, we had one of those moments in which you shove a forkful of your food at your dining partner, repeating over and over, “You just have to try this!” And try it we did. I was happy to have demonstrated to David how joyful birthdays can be. David was happy to have made it to the end of his incredibly exhausting fun scavenger hunt. Seagrass was a huge success, and we’ll be back – during the day, though, so as not to be lured by those beckoning green lights. Richard Perez is the Wine Director not Ruben. He is the oldest son. He is not in the picture. No thank you, it is a very nice article!